The Agribuggy 5D is one of the latest of a range of specialist sprayers to be developed by T.J. Frazier. It is designed to fill the gap between Fraziers existing low ground pressure machines and the larger, more expensive self-propelled sprayers. It shares many of the features of the well proven 3 & 4D machines including the cab, the four wheel drive system, and hydraulics. However the carrying capacity is considerably more at 2.5T due to the uprated chassis and suspension and and the heavy duty industrial axles. The 90hp, turbo engine is the same as fitted in the 4D. 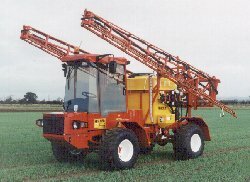 Although designed to carry a 1500l sprayer with up to 24m booms, the size, weight and cost have all been kept down to sensible proportions. The all-up weight of the 5D fitted with a 24m/1500l sprayer is only just over 4t. It is also very well balanced with a loaded weight split on some variants as good as 52% on the rear axle and 48% on the front. Like the rest of the range this makes it a very capable low ground pressure machine when fitted with the standard 38x20x16 Terra-Tyres. Large diameter row crop wheels allow all season use with a respectable under-axle clearance of 24ins. 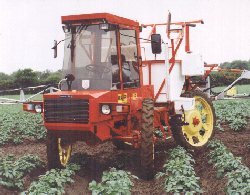 A smooth under belly sheet is also available together a front shield to smooth the crop down and keep damage to a minimum.The optional, electronically controlled four wheel steering system makes it extremely manoueverable and ideal for potatoes and vegetables where tight turn-ins are essential. A range of 1500l sprayers is available which feature diaphragm pumps, 3 stage filtration, motorised in cab controls, chemical inductors, stainless steel spraylines, handwash facilities and clothing lockers. Self levelling booms up to 24m in steel and 28m in aluminium have excellent suspension systems which, with the 5Ds own suspension ensure excellent stability and much higher working speeds than conventional tractor based systems without sacrificing operator comfort.